So this has been in practice since 2011 in Australia, but clearly St. Louis, MO had no idea. A college roommate of mine caused a head-on collision under an overpass due to driving (drunk as a skunk) on the wrong side of the road. If waterscreen stop signs were installed to warn motorists to stop and turn around, it at the very least would have resulted in a free car wash as he plowed on through. Not quite worth the DUI and legal bills though. I've never heard of these before, but I think they're ingenious. Laservision, an entertainment light show manufacturer based in Australia, made a nifty little system that deploys a waterfall-on-demand while beaming an image onto the sheet of water. In this case, a stop sign that requires absolute blindness in order to ignore. 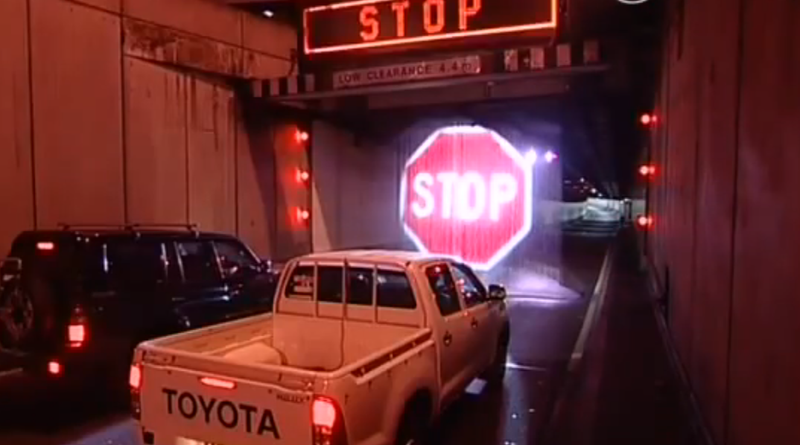 Here's a video of the Softstop Barrier System being deployed at an entrance of the Sydney Harbour Tunnel when a truck driver ignores various warning signals that his load is too tall. Unbelievable.